Begin your agricultural adventure to Fond du Lac and the Lake Winnebago Region with a make-and-take project at the Wreath Factory in Plymouth, featuring 16,000 feet of garden art, local artisans creations, home décor and a year 'round Christmas display. Schedule your lunch at the Butternut Café at the Historic Wade House Visitor Center, then tour the Wesley W. Jung Carriage Museum, home to Wisconsin's most extensive and diverse collection of 70 horse- and hand-drawn vehicles. During the summer season, visitors enjoy a horse-drawn wagon ride to access the Wade House Stagecoach Hotel, the Dockstader Blacksmith Shop and the Herrling Sawmill. Make your way up the east side of Lake Winnebago to meet award-wining conservation leaders at the family-owned Meuer Farm. Take a tractor-drawn hayride tour to see the 159-acre family owned farm. Include time to shop at the Busy Bee Country Store & Market for specialty grains and flours, maple syrup, honey and other Meuer farm-fresh specialty items. A special Farm Flavors Lunch using farm fresh food items from Meuer Farm may be arranged for your group. Discover LaClare Farms, a one-of-a-kind goat milking facility and on-site creamery. View goat feeding and milking daily at 4:30 pm, then tour the cheese making process and peek into the cheese aging cellars. Complete your visit with an enjoyable dinner in the Café, where they use locally sourced seasonal produce. Check into one of Fond du Lac's fine hotels - we're pleased to assist you with rates and availability. Tour Rosendale Dairy/Milk Source, a modern Wisconsin dairy farm with two 80-cow carousels where cows are milked three times daily and live in a clean, temperature-controlled barn where they are fed a nutritious diet. Allow us to offer lunch suggestions - simple fare or a more bountiful meal to tide you over! Your next stop is Larson's Famous Clydesdales for an entertaining 90-minute guided tour and show of famous champion Clydesdales. Pet a rare baby Clydesdale up-close-and-personal! Continue the day with a buzz ‐ the buzz of 13 colonies of bees and the production of honey at Marshview Honey and Alpaca Farm in Waupun. This serene farm, overlooking the Horicon Marsh National Wildlife Refuge, features raw honey, honey products, yarn and raw fiber in their store. Time to relax in your hotel at the end of a busy day! Your first stop today is Cristo Rey Ranch (formerly called Villa Loretta), where you'll discover the unexpected at this ranch run by nuns. The ranch is home to over 300 farm and exotic animals and a petting zoo! Groups may schedule hayrides and guided tours, sheep herding demonstrations and more. Tour The Little Farmer - a festive family farm orchard and market featuring apples, pumpkins, apple cider and an on-site bakery. 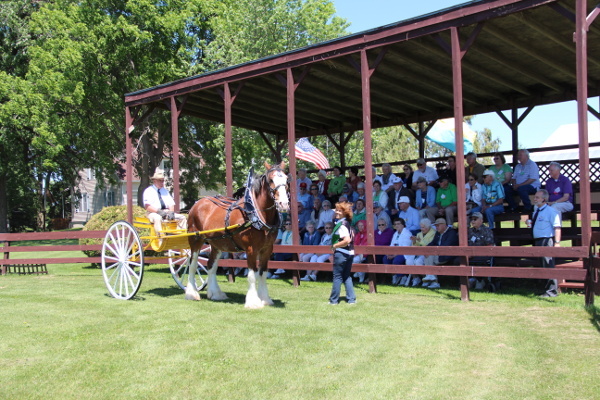 Hop on for a hayride and tour of the grounds including the Craft Barn and Apple House. Complete your agricultural and culinary extravaganza by treating the group to a special visit to Kelley Country Creamery - voted "Best Ice Cream in America" by Good Morning America. Learn how this family farm, in business since 1861, turns farm-fresh milk into over 300 flavors of ice cream - 22 flavors are featured daily - at their farmstead ice cream parlor.